Clothing/Jewelry Description A blue blazer, Apple Bottom jeans, and sparkly silver shoes. Distinguishing Characteristics African-American female. Brown hair, hazel eyes. 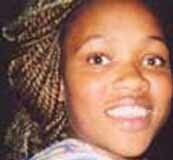 Allen wore micro-braided blonde hair extensions at the time of her disappearance. She was a non-smoker and non-drinker in 2007. She has a tattoo of two brown eyes and a rose on her left shoulder, and a tattoo of a half-moon behind her left ear. Her ears are pierced. Allen was last seen at a female friend's apartment in the 8600 block of Frost Avenue in Berkeley, Missouri on March 13, 2007. She was staying there for a few days. Allen was at the apartment when her friend left for work, and the friend spoke to her on the telephone that day while Allen was at the home. When Allen's friend returned, Allen was missing. Authorities stated Allen is missing under suspicious circumstances and may be in danger. It is uncharacteristic of her to leave without warning. All of her belongings were left behind, including her purse and a tax return check for $2,000. On the day of her disappearance she went to a job interview at a telemarketing company on Watson Road and made an appointment for a second interview; she was looking for work closer to her St. Louis, Missouri home. Allen was a nursing student at the time of her disappearance. Her case remains unsolved. Updated 5 times since October 12, 2004. Last updated October 14, 2014; picture added.